Proliferation is a physiological process of cell division that occurs in almost all tissues, resulting in an increase of the number of cells. Mitosis is the main way for eukaryotes to divide cells, such as multicellular organisms in a mitotic way to increase the number of somatic cells. During the cell mitotic division, a single mother cell divides to produce two daughter cells to replace cells that have been injured or have died, so cell proliferation is defined by the balance between cell divisions and cell loss through cell death or differentiation. The process of cell proliferation plays a key role from the time of embryogenesis to development of the whole organism from single- or double- cell embryo and continues its critical role in the maintenance of adult tissue homeostasis by recycling the old cells with new cells. Early development is characterized by the rapid proliferation of embryonic cells, which then differentiate to produce the many specialized types of cells that make up the tissues and organs of multicellular animals. As cells differentiate, their rate of proliferation usually decreases, and most cells in adult animals are arrested in the G0 stage of the cell cycle. A few types of differentiated cells never divide again, but most cells are able to resume proliferation as required to replace cells that have been lost as a result of injury or cell death. In addition, some cells divide continuously throughout life to replace cells that have a high rate of turnover in adult animals. Cell proliferation is thus carefully balanced with cell death to maintain a constant number of cells in adult tissues and organs. In general, the cells of adult animals can be grouped into three categories with respect to cell proliferation. The first category, such as human cardiomyocytes, is no longer able to proliferate. They are produced, differentiated, and retained throughout the life of the organism during embryonic development. They will never be replaced, even if they have been lost due to injury. In contrast to the first category, the second one can resume proliferation when enter the G0 stage of the cell cycle, including skin fibroblasts, smooth muscle cells, the endothelial cells that line blood vessels, and the epithelial cells of most internal organs, such as the liver, pancreas, kidney, lung, prostate, and breast. The third category, including blood cells, epithelial cells of the skin, and the epithelial cells lining the digestive tract, has short life spans and must be replaced by continual cell proliferation in adult animals. Within them, the fully differentiated cells do not proliferate by themselves. Instead, they are replaced via the proliferation of cells that are less differentiated, called stem cells. A wide range of growth factors combines with the receptor tyrosine kinases (RTKs) which are the second major type of cell-surface receptors, to regulate cell proliferation, differentiation, and cell survival. Fibroblast growth factors (FGFs) are a family of growth factors involved in wound healing and angiogenesis. Among the various members of this family, FGF-2 and FGF-4 have been shown increased human cells proliferation in vitro. FGF signals proliferation through the mitogen-activated protein kinase (MAPK) cascade in various cell types. FGFs bind fibroblast growth factor receptors (FGFRs), epidermal growth factors (EGFs) bind epidermal growth factor receptors (EGFRs), vascular endothelial growth factor (VEGF) and platelet-derived growth factor (PDGF) bind PDGFR, and hepatocyte growth factor (HGF) binds c-Met, which causes phosphoinositide-3 kinase (PI3K) to be activated, converting PIP2 to PIP3 and activating Akt/protein kinase B (PKB) and the mitogen-activated protein kinase (MAPK) Erk. Phosphorylated Erk either enters the nucleus and activates transcription of cellular proliferation genes like c-myc, or activates downstream receptors like Rsk that then activates proliferation genes. Bone morphogenetic protein (BMP) belonging to the TGFβ superfamily are known to affect bone formation. Both BMP-2 and BMP-3 can increase proliferation of cells. Since these factors all affect bone formation at different rates and some have a greater effect on proliferation, synergistic pairs of these growth factors can be used at optimal doses and at specific points during the bone regeneration process. Serine also plays an essential role in the synthesis of biomolecules that support cell proliferation. TGFβ signaling occurs when TGFβ or factors from the family bind a type II serine-threonine kinase receptor recruiting another such transmembrane protein (receptor I). Receptor I phosphorylates the primary intracellular downstream molecules SMADs, causing their translocation into the nucleus and specific gene transcription. Receptor I can be ALK-1, ALK-2, ALK-3, or ALK-6 that signal SMAD 1, SMAD 5, and SMAD 8, or can be ALK-4, ALK-5, or ALK-7 that signal SMAD 2 and SMAD 3. Signaling via SMAD 1, SMAD 5, or SMAD 8 is required for chondrocyte differentiation while signaling through SMAD 2 or SMAD 3 blocks chondrocyte differentiation. TGFβ and members of this growth factor family can also signal via the mitogen-activated protein kinase (MAPK), Rho GTPase and phosphoinositide-3 kinase (PI3K) pathways. The mitogenic effects of BMP-3, on the other hand, have been found to be mediated by TGFβ/activin signaling and not by any of the MAPK signaling pathways, with ALK-4 and SMAD 2 and SMAD 3 being the key players involved. 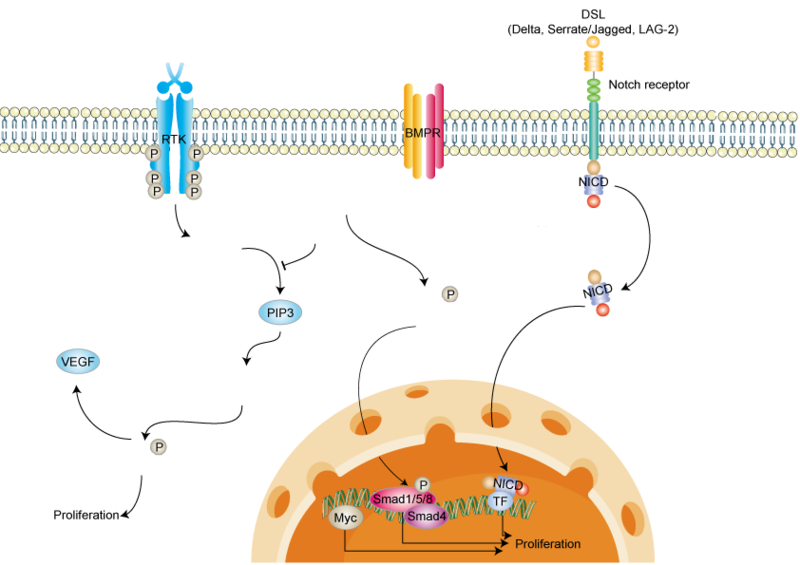 Notch signaling is primarily activated when ligands of the DSL (Delta, Serrate/Jagged, LAG-2) family activate Notch receptors on adjacent cells. This cause the release and nuclear localization of the Notch intracellular domain (NICD), which together with transcriptional regulators modifies the expression of target genes. It has been shown that over-expression of the Notch1 intracellular domain (NICD) inhibits cellular proliferation and alters the neuroendocrine phenotype of medullary thyroid cancer cells. Cancer can result from the abnormal proliferation of any type of cell. The most important distinction for the patient is between benign tumors, which remain confined to their site of origin, and malignant tumors, which can invade normal tissues and spread throughout the body. PSAT1 is the protein-coding gene of phosphoserine aminotransferase, which catalyzes serine biosynthesis. Previous studies have shown that PSAT1 plays a vital role in cell proliferation as it acts as an oncogene in colon cancer and non-small cell lung cancer (NSCLC). PSAT1 is overexpressed in colon cancers where it contributes to cell proliferation and chemo-resistance, which results in a poor prognosis. PSAT1 is significantly upregulated in ER-negative breast cancer and was correlated with a poor patient prognosis. Moreover, PSAT1 was found to be regulated by ATF4, which then activated the GSK-3β/β-catenin pathway. This resulted in the enhancement of cyclin D1 expression and the promotion of cell proliferation. Statistical analysis of many results showed that PSAT1 up-regulation was correlated with tumor development and poor prognosis. These observations have prompted us to speculate the role of PSAT1 in the initiation and development of ER-negative breast cancer. 1. Cooper, G.M. The cell: A Molecular Approach. 2nd edition. 2002. 2. Rodrigues, M.; et al. Growth factor regulation of proliferation and survival of multipotential stromal cells. Stem Cell Research & Therapy. 2010, 1: 32.